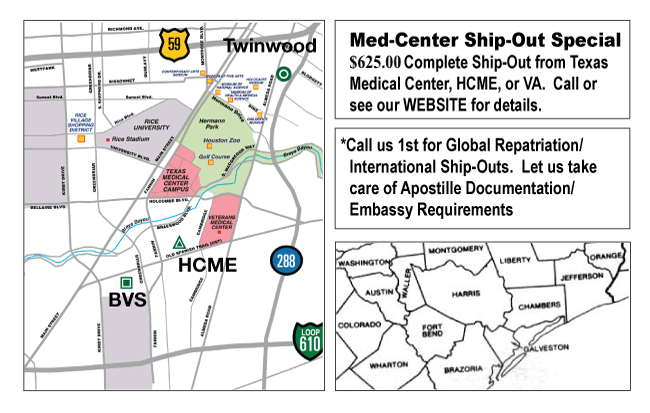 We are located on the edge of the Texas Medical Center just minutes from the Hospital District, the Harris County Medical Examiner, and the VA Hospital. Our proximity to Houston’s freeway system enables us to offer rapid response times on First Calls. Being centrally located also helps us deliver better value to our customers located in adjacent counties. With the first 25 miles included in our First Call price, we can reach counties other than Harris (home county for Houston, the Texas Medical Center, and Twinwood) in our service area within a very reasonable response time and for minimal extra mileage charge. Additionally, our per-mile rate of $1.95/mile (for mileage above the first 25) is much more reasonable than most of our competitors, some of which charge as much as $2.50 per mile. We regularly make calls in Brazoria/Chambers/Fort Bend/Galveston/Harris/Liberty/Montgomery/Waller counties with travel times rarely exceeding an hour to an hour and a quarter.